Waiting to Exhale is one of my all-time fave movies. Angela Basset/Bernadine's two-timing husband's clothing inferno is classic, but my favorite scene is between Robin and one of her sub-par flavors of the week. A drunk, sloppy Troy shows up 2 hours late to pick her up for a barbecue, wearing a questionable outfit: a leather vest sans shirt underneath and black jeans. After he slurs some choice words to her, a furious Robin fires back, "Troy, take your drunk-a**, leather-wearin'-in-the-summertime, need-a-shave-a** home!" That scene always cracks me up! Um, you just cursed her out and called her "raggedy," so I think you know the answer to that one. 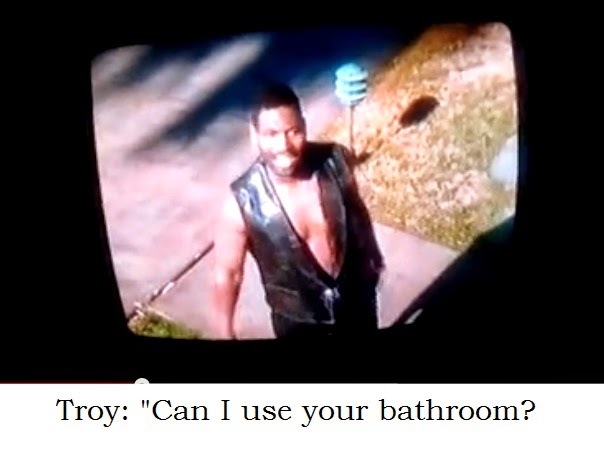 Troy's getup was a definite mistake in 1995, but in recent years, leather has become a seasonless fabric. Using modern silhouettes and paired with lighter colors, leather looks cool even when temps are hot. I styled a faux leather sleeveless top with boyfriend jeans for a laid-back, edgy look. Do you wear leather year-round? Can you believe it's been almost 20 years since Waiting to Exhale came out?! Gulp.